Sly Stone, photographed by Kelly A. Swift at the House of Blues in January 2007, performed a full-length show at the same venue over the weekend. I reviewed shows two nights in a row (Matt Costa and Satisfaction on April 24 and Sly & the Family Stone and Jupiter Rising on April 25) and the experiences couldn't have been more different. When an artist keeps an audience waiting two hours just to hear a mere hour's worth of music, the show better be amazing. 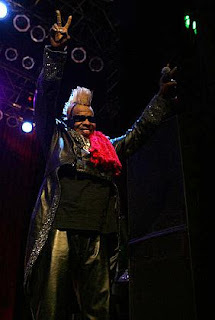 Sly Stone's own remarks early in his set at the House of Blues in Anaheim on Friday night (April 25, 2008) were likely a bit revealing: "Everybody made the rehearsals except me, but I made the gig!" And while the concert marked the first full-length appearance by Sly and the Family Stone in decades, the reclusive and little-understood 65-year-old leader of the pioneering '60s-spawned funk act did show up as promised to lead his large band through their best-known hits. And to be fair, Stone was much more impressive and engaging at the Mouse House on Friday night than the odd reunion appearance at the 2006 Grammy Awards. "Dance to the Music," "Everyday People," "I Want to Take You Higher" and "Family Affair" are among Stone's best-remembered tracks and it was historic to hear them performed by their architect in the intimate setting. But Stone, who blended funk, soul and psychedelia in the late 1960s and early '70s, came off much like Brian Wilson, a man truly alone even in the largest and most public of settings. Stone's voice was strong in brief spurts, but both his singing and keyboard playing reflected the fragile nature of his condition. From the opening strains of "Sing a Simple Song" that kicked off the show to an a cappella version of a new tune featuring the lyrics "I'm a Real Model, not a role model," there was more of a sense of being at a historic event rather than at a great show. Opening act Jupiter Rising played an energetic mix of hip-hop and pop that failed to connect with the crowd. Although lead singer Jessie Payo and rapper Spencer Nezey delivered songs such as the sexually-charged "Flip My Switch" and melodic "Electropop" with fire, this crowd was on hand to hear Sly. Little did they know when Jupiter Rising left the stage after a quick six-song set at 8:24 p.m., they would have to wait until 10:15 for Sly & company to show. What about the show I caught a night earlier featuring headliner Matt Costa and opening outfit Satisfaction? Indeed, Costa's laid back approach proves to be a perfect fit with his intricate style of songcraft, while Satisfaction impresses with a retro-tinged attack. Performing before a sold-out crowd as part of the Orange County Performing Arts Center's Off Center Series on Thursday night, Huntington Beach native Matt Costa delivered exactly the kind of pleasing, no-frills show a casual listener might expect. Whereas many of his contemporaries are all about in-your-face style and attitude, Costa proved his prowess continues to be about intricate song craft and how he can help listeners connect with those tunes. Armed with his acoustic guitar – and occasionally adding harmonica or electric keyboards to his on-stage arsenal – Costa and his four-man band offered up solid versions of his best-known folk rock and alt country-styled material over the course of 90 minutes. Although he wears many of his influences on his sonic sleeve – notably Donovan, the Beatles and Neil Young – it would not be smart to dismiss Costa's gifts as something strictly out of the past packaged for today's audiences. He proved throughout his set that complex chord patterns, melodic choruses and an emotive voice can be lethal weapons in the quest to get ears turned his way. Although fans seem most delighted with the performance of the breezy '70s-styled "Cold December" and "Yellow Taxi," the upbeat country of "Sweet Rose" and "Ballad of Miss Kate" also got the general admission audience on the floor moving to the music. Material from his most recent album, 2008's "Unfamiliar Faces," also worked well in the set, notably the Kinks-flavored "Trying to Lose My Mind" and bouncy "Miss Magnolia." If members of the Dave Clark Five, Raspberries and Franz Ferdinand had bridged the distance between their respective generations and formed a band together, it might well sound like Orange County's own Satisfaction. Led by ex-Smile frontman singer-guitarist Michael Rosas, the quartet's propulsive attack was truly formidable. Playing eight songs across 40 minutes, Satisfaction (rounded out by bassist Aaron Wahlman and brothers Matthew Fletcher on keyboards and James Fletcher on drums) featured songs from the band's wonderful 2007 release "Cougars, Sharks & Flying Sparks." It's not a surprise that Costa specifically praised Satisfaction during his set. Songs such as the infectiously raucous "Feel So Stupid" and "So We'll Just Take the Night" should continue to draw new audiences to this wonderful troupe. Talk about wiping away the Monday blues. KOCH Records has just announced that The Smithereens will be releasing a concert CD on May 27, 2008! The 18-song collection will not only feature many of the quartet's best-known classics, but several new songs too. Album Features Two Brand New Songs! NEW YORK, NY--(MARKET WIRE)--Apr 14, 2008 -- KOCH Records is pleased to announce the newest album by rock band The Smithereens. "Live In Concert - Greatest Hits and More" features music from The Smithereens' four-night stint at The Court in New Brunswick, New Jersey, a musical home away from home for the group, which took place January 30th - February 2nd, 2008. The band, all hailing from surrounding Central Jersey towns, played the Court Tavern often at the start of their career. The album features live recordings of two brand new songs, "Any Other Way" and "Since You Went Away." The set also includes Buddy Holly's classic (and a big influence for The Smithereens) "Well Alright," and the ripping interpretation of the "Batman" theme, a live staple for the band. For the past 25 years, The Smithereens have toured non-stop, recording and releasing Gold and Platinum albums that spawned Top 40 radio hits such as "A Girl Like You," "Too Much Passion," "Blood And Roses," "Only a Memory" and "Behind The Wall Of Sleep." But at the beginning of that long and successful road, the loved group spent many sweaty, rock filled evenings in the damp, close quartered basement of The Court. 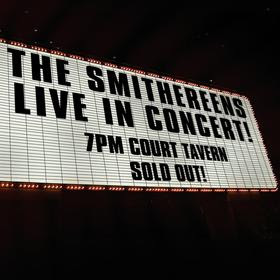 Live at The Court takes us back to that hallowed ground and brings back the energy and edginess that was present at the beginning of The Smithereens' career. The club was packed for every performance, and the love and energy for the Smithereens is evident on each track. This album features the Smithereens in their natural habitat, playing great music for their hometown fans. It shines a light on the love of their fans, and what the group is about. Mike Peters (seen here) will perform at the Coach House on Sunday night, April 13. Anyone familiar with modern alternative rock knows the Alarm, a group formed in Rhyl, Wales in 1981. Like Ireland's U2 and America's own The Call, the Alarm wrote and performed anthems that soared while also offering up political spiritual messages. The band scored a number of top 40 hits and top-selling albums during the decade. The group's full-length debut, 1983's "Declaration," yielded the stellar track "Sixty-Eight Guns." Other radio staples followed, including "Where Were You Hiding When the Storm Broke," Spirit of '76," "Absolute Reality," "Strength" and "Rain in the Summertime." 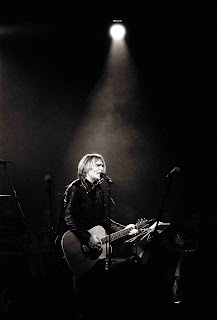 Now, Alarm frontman Mike Peters is on a short solo tour that includes a stop at the Coach House in San Juan Capistrano on Sunday night, April 13, 2008. He will likely include acoustic versions of Alarm classics, as well as solo material from releases such as "Feel Free" and "Rise." Orange County's own Beyond 7 and area singer-songwriter Tim Moyer will also open for Peters. For more information, visit http://www.thecoachhouse.com/ or call the venue at (949) 496-8930. I was wrong; R.E.M. was not down for the count. The band's latest album "Accelerate" is truly the best collection of songs from the Athens, Georgia outfit since 1991's "Out of Time" or arguably that album's noteworthy follow-up "Automatic for the People." The 34-minute, 11-song "Accelerate" boasts great indie rockers ("Living Well is the Best Revenge," "Horse to Water"), infectious power pop (the first single "Supernatural Superserious," "Hollow Man") and affecting slower gems ("Houston," the dazzling "Until the Day is Done"). The songs are short and get to their respective destinations in fast and dramatic fashion. Biting lyrics, effective chord changes and emotive vocals from singer Michael Stipe tell part of the story, but the magic that typified songs on "Murmur" and "Reckoning" is back on display here on songs such as the aforementioned "Until the Day is Done" and "Sing for the Submarine." While the departure of drummer Bill Berry in October 1997 left a long-lasting void in the band, it appears that Stipe, guitarist Peter Buck and bassist Mike Mills have rediscovered something I thought lost on "Accelerate." 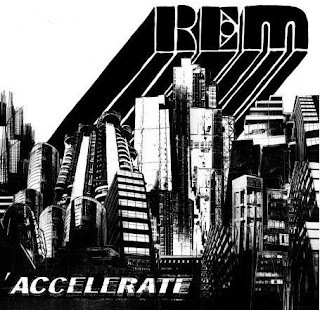 Produced by Jacknife Lee and R.E.M., "Accelerate" already ranks as one of the best albums of 2008. "Accelerate" has given me reason to celebrate, and R.E.M (once again) rocks. HER VOICE REMAINS: Drummer Stefan Veselko, bassist Jeffrey P., guitarist Elias Gamboa and singer Danielle will perform at the Coach House in San Juan Capistrano on Friday night, April 4. Her Voice Remains has the kind of compelling story that could well be the basis of a '00s dramatic film. The band was formed in 2005, with Elias Gamboa on guitar, Jeffrey P. on bass and Danielle on drums. "Danielle and I were in a relationship and then we broke up," Jeffrey P. recalled. "She subsequently left the band and we recruited another drummer." It was then that the trio decided to find a singer to complete the line-up. Ironically, Danielle asked if she could audition. "She came in and nailed it," recalled Jeffrey P. of the audition roughly eight months or so after Danielle had stopped drumming for the group. Danielle admits her new role in the band was a challenge. "It was a big change moving up to the front (as singer) ... but I think I'm a better singer than a drummer," she said. After an interim percussionist left the troupe, drummer Stefan Veselko was brought in for an audition. "We found Stefan via MySpace. He came in the day before Thanksgiving (2005) and nailed it," Jeffrey P. said in a recent interview. "Half way through the first song (I knew he was our drummer)." Added Veselko: "Their influences popped out. I contacted Jeffrey and he sent files. I learned them note by note. It just clicked." Her Voice Remains has shared the bill with a wide range of well-known acts, including Human League, A Flock of Seagulls, Dead Man's Party and English Beat. With a sound that has singer Danielle's hypnotic vocals layered atop Gamboa's chain-saw guitars and driving, in-the-pocket grooves delivered by Veselko and Jeffrey P, Her Voice Remains joins fellow area bands such as the Dear & Departed, Rock Kills Kid and Vale as mining new sonic ore in '80s-branded rock. "Our music is a bit reminiscent (of the past), but it's unique," Danielle said. 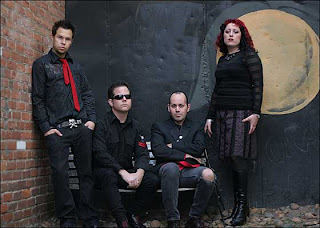 From the driving "Love is Gone" and "Into the Sun" to the post-punk of "Dead Arms" and "Let Go Away," Her Voice Remains is an outfit at home playing up-tempo and stylish rock as featured on the band's self-titled 2007 album. The sound of Her Voice Remains recalls seminal acts such as the aforementioned Siouxsie and the Banshees, as well as the Martha Davis-led Motels and modern rock heroes such as Giant Drag and Blonde Redhead. "We struggle," Jeffrey P. said of how best to describe the sound of Her Voice Remains. "In my opinion, it's Blondie meets Siouxsie and the Banshees in a dark alley." Berlin, Her Voice Remains and Night Creatures will perform at the Coach House, 33157 Camino Capistrano, San Juan Capistrano, at 8 p.m. on April 4. Tickets will be available for $23.50 at the box office the evening of the show, or for only $18 in advance when purchased from Her Voice Remains. For information on how to get tickets in advance, visit the band's Web site at www.HerVoiceRemains.com. To hear songs from the band's recent CD release, visit www.myspace.com/hervoiceremains. For more details on the April 4 show, call the Coach House at 949-496-8930 or visit www.thecoachhouse.com.